For the son of Sir Winston Churchill, see Randolph Churchill. For the biography, see Lord Randolph Churchill (book). 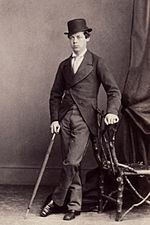 Lord Randolph Henry Spencer-Churchill (13 February 1849 – 24 January 1895) was a British statesman. Churchill was a Tory radical and coined the term 'Tory democracy'. He inspired a generation of party managers, created the National Union of the Conservative Party, and broke new ground in modern budgetary presentations, attracting admiration and criticism from across the political spectrum. His most acerbic critics resided in his own party among his closest friends; but his disloyalty to Lord Salisbury was the beginning of the end of what should have been a glittering career. His elder son, Winston, wrote a biography of him in 1906. Born at 3 Wilton Terrace, Belgravia, London, Randolph Spencer was the third son of John Spencer-Churchill, Marquess of Blandford, and his wife the Marchioness of Blandford (née Lady Frances Vane); upon John's father's death in 1857, they became the (7th) Duke of Marlborough, and the Duchess of Marlborough, respectively. He was at first privately educated, and later attended Tabor's Preparatory School, Cheam. In January 1863 he travelled the short distance by private train to Eton College, where he remained until July 1865. He did not stand out either at academic work or sport while at Eton; his contemporaries describe him as a vivacious and rather unruly boy. Among the lifelong friendships he made at school were with Edward Hamilton and Archibald Primrose (later Lord Rosebery). In October 1867, he matriculated and was admitted at Merton College, Oxford. At Oxford, Primrose, now Lord Dalmeny, joined him at the champagne-fuelled parties as members of the Bullingdon Club. Randolph was frequently in trouble with the university authorities for drunkenness, smoking in academic dress, and smashing windows at the Randolph Hotel. His rowdy behaviour was infectious, rubbing off on friends and contemporaries; he gained a reputation as an enfant terrible. He had a liking for sport, but was an avid reader, playing hard and working hard. Churchill experienced none of the early doubts but made many mistakes, as alluded to in Rosebery's biography. He never regretted being an early friend and admirer of the Disraelis. His behaviour was however the later cause of dissension in his relations with a colder, more aloof, disciplinarian Salisbury. Churchill's youthful exuberance did not prevent him gaining a second-class degree in jurisprudence and modern history in 1870. A year later he and his elder brother, George, were initiated into the rites of Freemasonry, as later his son Winston would be. At the general election of 1874 he was elected to Parliament as Conservative member for Woodstock, near the family seat, defeating George Brodrick, a Fellow, and afterwards Warden, of Merton. His maiden speech, delivered in his first session, prompted compliments from William Harcourt and Benjamin Disraeli, who wrote to the Queen of Churchill's "energy and natural flow." Randolph Churchill was a close friend of Nathan Rothschild, 1st Baron Rothschild, and received "extensive loans" from the Rothschilds. He reported on the mining industry in South Africa on their behalf, where their agent Cecil Rhodes was consolidating mining deposits which ultimately led to the creation of De Beers. Lord Randolph Churchill and Lady Randolph Churchill (Jennie Jerome) in Paris (1874) by Georges Penabert. In January 1875, only about a month after Winston's birth, Randolph made repeated visits for an undisclosed ailment to the family doctor, Dr Oscar Clayton, a specialist in the treatment of syphilis at his London practice at 5, Harley Street. According to Frank Harris, who published the allegation in his scandalous autobiography, My Life and Loves (1922-27), "Randolph had caught syphilis..." Dr Clayton was, however, a "society doctor" with many patients among the British upper class. Harris' book put forward a story, told by Louis Jennings, who had published Randolph's 1880–88 speeches, to support the syphilis claim. Jennings, however, who was dead when Harris recounted the story, was not a reliable source: his friendship with Churchill had ended acrimoniously after Randolph attacked the Tory party and several of its members in 1893. Jennings' account as reported by Harris has never been corroborated. By 1924, Harris had fallen out with Winston Churchill, for whom he had been a literary agent. Harris had made similar but false or unsubstantiated assertions about Oscar Wilde and Guy de Maupassant. A paper by John H. Mather of the National Churchill Library and Center calls into question Harris' veracity and offers the alternative theory of a "left side brain tumour", which they claim would be more consistent with Churchill's observed afflictions. Mather noted that "There is no indication that Lady Randolph or her sons were infected with syphilis. If it is accepted, as reported, that both boys were born prematurely, this was more likely to have been due to a weak opening to the womb than to the disease. If the boys were not born prematurely, that would cast even greater doubt on a diagnosis of syphilis. Neither son was born with the infections that resemble secondary syphilis, nor did they have late hereditary syphilis, commonest between the ages of 7 and 15, manifested by deafness, partial blindness and/or notched teeth." It was not until 1878 that he came to public notice as the exponent of independent Conservatism. He made a series of furious attacks on Sir Stafford Northcote, R. A. Cross, and other prominent members of the "old gang". George Sclater-Booth (afterwards 1st Baron Basing), President of the Local Government Board, was a specific target, and the minister's County Government Bill was fiercely denounced as the "crowning dishonour to Tory principles", and the "supreme violation of political honesty". Lord Randolph's attitude, and the vituperative fluency of his invective, made him a parliamentary figure of some importance before the dissolution of the 1874 parliament, though he was not yet taken quite seriously, owing to his high-pitched hysterical laugh. In the new parliament of 1880 he speedily began to play a more notable role. Along with Henry Drummond Wolff, John Gorst and occasionally Arthur Balfour, he made himself known as the audacious opponent of the Liberal administration and the unsparing critic of the Conservative front bench. The "fourth party", as it was nicknamed, at first did little damage to the government, but awakened the opposition from its apathy; Churchill roused the Conservatives by leading resistance to Charles Bradlaugh, the member for Northampton, who, an avowed atheist or agnostic, was prepared to take the parliamentary oath under protest. Stafford Northcote, the Conservative leader in the Lower House, was forced to take a strong line on this difficult question by the energy of the fourth party. The long controversy over Bradlaugh's seat showed that Lord Randolph Churchill was a parliamentary champion who added to his audacity much tactical skill and shrewdness. He continued to play a conspicuous part throughout the parliament of 1880-85, targeting William Ewart Gladstone as well as the Conservative front bench, some of whose members, particularly Sir Richard Cross and William Henry Smith, he singled out for attack when they opposed the reduced Army estimates. This would be the ostensible cause for his resignation because Salisbury failed to support his Chancellor in cabinet. They opposed his unionist politics of 'economising' by Tory tradition, making Randolph grow to hate cabinet meetings. From the beginning of the Egyptian imbroglio Lord Randolph was emphatically opposed to almost every step taken by the government. He declared that the suppression of Urabi Pasha's rebellion was an error, and the restoration of the khedive's authority a crime. He called Gladstone the "Moloch of Midlothian", for whom torrents of blood had been shed in Africa. He was equally severe on the domestic policy of the administration, and was particularly bitter in his criticism of the Kilmainham Treaty and the rapprochement between the Gladstonians and the Parnellites. By 1885 he had formulated the policy of progressive Conservatism which was known as "Tory Democracy". He declared that the Conservatives ought to adopt, rather than oppose, popular reforms, and to challenge the claims of the Liberals to pose as champions of the masses. His views were largely accepted by the official Conservative leaders in the treatment of the Gladstonian Representation of the People Act 1884. Lord Randolph insisted that the principle of the bill should be accepted by the opposition, and that resistance should be focused on the refusal of the government to combine with it a scheme of redistribution. The prominent, and on the whole judicious and successful, part he played in the debates on these questions, still further increased his influence with the rank and file of the Conservatives in the constituencies. At the same time he was actively spreading his gospel of democratic Toryism in a series of platform campaigns. In 1883 and 1884 he went to the radical stronghold of Birmingham, and in the latter year took part in a Conservative garden party at Aston Manor, at which his opponents paid him the compliment of raising a serious riot. He gave constant attention to the party organisation, which had fallen into considerable disorder after 1880, and was an active promoter of the Primrose League, which owed its origin to the inspiration of one of his own “fourth party” colleagues. In 1884 progressive Toryism won out. 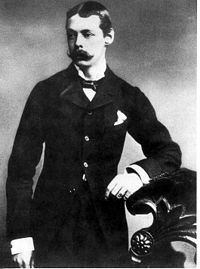 At the conference of the National Union of Conservative Associations, Lord Randolph was nominated chairman, despite the opposition of the parliamentary leaders. A split was averted by Lord Randolph's voluntary resignation which he had done his best to engineer; but the episode had confirmed his title to a leading place in the Tory ranks. He built up Tory Democracy in the towns reinforcing the urban middle classes part in the party, while simultaneously including a working-class element. His unsuccessful bid for the party leadership was inextricably part of the National Union's attempt to control the party organization. It had originally been founded by Tory peers to organize propaganda to attract working men's votes, registration, choose candidates, conduct elections; associations were linked to provincial unions. Lord Randolph was not the originator but his campaign of 1884 encouraged the leadership to improve on their designs. For the first time since 1832 the Conservatives won in the majority of English boroughs in November 1885. It was strengthened by the prominent part he played in the events immediately preceding the fall of the Liberal government in 1885; and when Hugh Childers's budget resolutions were defeated by the Conservatives, aided by about half the Parnellites, Lord Randolph Churchill's admirers were justified in proclaiming him to have been the "organiser of victory". His services were, at any rate, far too important to be refused recognition; and in Lord Salisbury's "caretaker" cabinet he was made Secretary of State for India on 24 June 1885. As the price of entry he demanded that Sir Stafford Northcote be removed from the Commons, despite being the Conservative leader there. Salisbury was more than willing to concede this and Northcote went to the Lords as the Earl of Iddlesleigh. During his tenure at the India Office during the short-lived minority Conservative administration, Churchill reversed policy over Burma. He sided with commercial interests and directed the Viceroy, Lord Dufferin, to invade Upper Burma in November 1885. With little discussion, Churchill then decided to annexe the final remnant of the once great Burmese kingdom, adding it as a new province of the Indian Raj as a "New Year present" for Queen Victoria on New Year's Day 1886. Soldier and explorer Sir Francis Younghusband considered Churchill the best Secretary of State the India Office ever had. In the autumn election of 1885 he contested Birmingham Central against John Bright, and though defeated here, was at the same time returned by a very large majority for South Paddington. In the contest which arose over William Ewart Gladstone's Home Rule bill, Lord Randolph again bore a conspicuous part, and in the electioneering campaign his activity was only second to that of some of the Liberal Unionists, Lord Hartington, George Goschen and Joseph Chamberlain. He was now the recognised Conservative champion in the Lower Chamber, and when the second Salisbury administration was formed after the general election of 1886 he became Chancellor of the Exchequer and Leader of the House of Commons. Churchill was new to the leadership ranks, and became a relatively isolated figure in the cabinet. He did not think in terms of consulting his supporters and building a base in Commons; instead he decided to use his strong public support to impose his positions on Prime Minister Lord Salisbury in both domestic and foreign affairs. He decided to demonstrate to the public that the Conservatives could be as economical in budgetary matters as Gladstone had been. Therefore he proposed a budget with significant slashes that surprised and annoyed the Conservative MPs. They were willing to compromise, but he insisted on additional cuts in the Army and Navy that alarmed the service ministers. Churchill decided to threaten resignation--it proved one of the great blunders in British political history. In his resignation letter he stated that It was because he was unable as Chancellor to support the service. He expected his resignation to be followed by the unconditional surrender of the cabinet, and his restoration to office on his own terms. Instead Salisbury accepted the resignation and Churchill was out in the cold. Goschen replaced him as Chancellor. For the next few years there was some speculation about a return to front-line politics but Churchill's own career was over. Even so, his economising ideas survived yet in the "Dartford Programme" of September 1886. Although he continued to sit in Parliament, his health was in serious decline throughout the 1890s. He was an ardent patron of horse-racing and in 1889, his horse L'Abbesse de Jouarre won The Oaks. In 1891, he went to South Africa, in search both of health and relaxation. He travelled for some months through Cape Colony, the Transvaal and Rhodesia, making notes on the politics and economics of the countries, shooting lions, and recording his impressions in letters to a London newspaper, which were afterwards republished under the title of Men, Mines and Animals in South Africa. He attacked Gladstone's Second Home Rule Bill with energy, and gave fiery pro-Union speeches in Ireland. During this time he coined the phrase "Ulster will fight, and Ulster will be right", echoing his earlier remark that in opposing Irish Home Rule "the Orange card would be the one to play". It was soon apparent that his powers were undermined by the illness which took his life at the age of 45. As the session of 1893 wore on, his speeches lost their old effectiveness. His last speech in the House was delivered in the debate on the East African Scheme in June 1894, and was a painful failure. An attempted round-the-world journey failed to cure him of his debilitating illness, believed by many to be syphilis. Lord Randolph started in the autumn of 1894, accompanied by his wife, but his health soon became so feeble that he was brought back hurriedly from Cairo. He reached England shortly before Christmas and died in Westminster. The gross value of his personal estate was entered in the Probate Registry at £75,971. This is the financial equivalent of over £8.34 million in 2018 terms, using the retail price index. He is buried near his wife and sons at St Martin's Church, Bladon, near Woodstock, Oxfordshire. His widow, Lady Randolph Churchill, married George Cornwallis-West in 1900, when she became known as Mrs. George Cornwallis-West. After that marriage was dissolved, she resumed by deed poll her prior married name, Lady Randolph Churchill. (Lord Randolph was her husband's courtesy title as the younger son of a duke and in English law does not qualify as a noble title in its own right.) Lord Randolph's son, Sir Winston Churchill, died on 24 January 1965, aged 90, exactly 70 years after the death of his father, having lived twice as long. Rosebery described his old friend and political opponent's death as one of "his nervous system was always tense and highly strung; ...he seems to have had no knowledge of men, no consideration of their feelings, no give and take." But he continued, "in congenial society, his conversation was wholly delightful. He would then display his mastery of pleasant irony and banter; for with those playthings he was at his best." Undoubtedly, he had some high political talents. He had a gift for mordant, wounding, sometimes very funny phrases. And, having thought up the most outrageous attack he had the nerve to deliver it, without fear of offending taste or friends or damaging his own repute....He was strong on insolence. He also had other attributes necessary to make his words resound, and his fame increase: a mnemonic name, an idiosyncratic appearance, and good delivery, whether on the platform or in the House of Commons. In addition he had sporadic charm, although intermingled with offensive and often pointless rudeness. Jenkins compares his youth to that of William Pitt the Younger: "Pitt was Prime Minister for 19 of his 46 years. Churchill had 11 months in office and was without rival in attracting so much attention and achieving so little." Lady Frances Anne Emily Vane (15 April 1822 – 16 April 1899), the eldest daughter of the 3rd Marquess of Londonderry and Lady Frances Anne Emily Vane-Tempest. Lady Cornelia Henrietta Maria Spencer-Churchill (17 September 1847 – Upper Brook Street, Mayfair, London, 22 January 1927), married 25 May 1868 Ivor Bertie Guest, 1st Baron Wimborne, by whom she had issue. 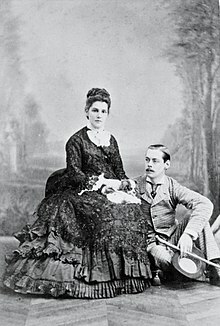 Lady Fanny Octavia Louise Spencer-Churchill (29 January 1853 – 5 August 1904), married 9 June 1873 Edward Marjoribanks, 2nd Baron Tweedmouth, by whom she had issue. Lady Anne Emily Spencer-Churchill (Lower Brook Street, Mayfair, London, 14 November 1854 – South Audley Street, Mayfair, London, 20 June 1923), married 11 June 1874 James Innes-Ker, 7th Duke of Roxburghe, by whom she had issue. Lady Georgiana Elizabeth Spencer-Churchill (10 St James's Square, St James's, London, 14 May 1860 – 9 February 1906), married 4 June 1883 Richard George Penn Curzon, 4th Earl Howe, by whom she had issue. In the ITV historical drama series Edward the Seventh, Lord Randolph (played by Derek Fowlds) is featured as a more natural character, sociably similar to Albert Edward, Prince of Wales and his other friends. His downfall is represented when he confronted Alexandra, Princess of Wales and demanded she use her influence with the Prince to stop Lord Aylesford proceeding with a divorce from his wife, Lady Aylesford, after she had planned to elope with Lord Randolph's elder brother, the Marquess of Blandford. He threatens to expose letters from the Prince to Lady Aylesford, so scandalous, so he says, that if they were to be exposed, "the Prince of Wales would never sit on the throne of England." Outraged, the Princess goes to see the Queen, who is equally indignant. Prime Minister Benjamin Disraeli informs the Prince, who is so angry that he challenges Lord Randolph to a duel in the South of France. Eventually, Lord Aylesford does not attempt to seek a divorce from his wife, and Lord Blandford does not elope with Lady Aylesford. Lord Randolph sends a note of apology to the Prince, which is merely acknowledged. Disgraced, Lord Randolph and his wife leave for America. Other notable appearances include the film Young Winston, in which he was portrayed by Robert Shaw, and the miniseries, Jennie, The Life of Lady Randolph Churchill, in which he was portrayed by actor Ronald Pickup, as the English aristocrat who falls in love with the daughter of an American billionaire property developer. Sir Winston referred to his father's career in several of the last chapters of A History of the English-Speaking Peoples written in Winston's 'wilderness years' in the inter-war years before he was recalled to the cabinet. The alternate history novel Fight and Be Right (by Ed Thomas), traces Churchill's further political rise in a world where his brother, the Marquess of Blandford, loses the scandalous letter between the Prince of Wales and Lady Aylesford, resulting in their father, the Duke of Marlborough, not being promoted to Lord Lieutenant of Ireland, and Randolph free of the scandal from the affair to rise further through the party ranks and become Prime Minister. ^ "Lord Randolph Churchill | British politician". Encyclopedia Britannica. Retrieved 12 December 2018. ^ Quinault, R. E. (March 1979). "Lord Randolph Churchill and Tory Democracy, 1880–1885". The Historical Journal. 22 (1): 141–165. doi:10.1017/S0018246X0001671X. ISSN 0018-246X. ^ Churchill, Winston C. 1906. Lord Randolph Churchill. 2 vols, Macmillan, London. ^ Churchill, Randolph. "Masonic Papers". The Development of the Craft in England. freemasons-freemasonary.com. Retrieved 30 July 2012. ^ "The Rothschild Archive". rothschildarchive.org. Retrieved 24 July 2017. 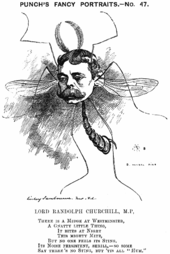 ^ a b "Lord Randolph Churchill: Maladies et Mort". Retrieved 17 August 2015. ^ Younghusband, Francis (1910). India and Tibet: a history of the relations which have subsisted between the two countries from the time of Warren Hastings to 1910; with a particular account of the mission to Lhasa of 1904. London: John Murray. p. 47. ^ Norman McCord and Bill Purdue, British History, 1815-1914 (2nd ed. 2007) pp 410-11,. ^ Eric Alexander (1961). Chief Whip. pp. 86–89. ISBN 9781442654655. ^ "Matjiesfontein History - Matjiesfontein". matjiesfontein.com. Retrieved 24 July 2017. ^ Paul Bew (2016). Churchill and Ireland. Oxford UP. pp. 55–56. ISBN 9780191071492. ^ "Index entry". FreeBMD. ONS. Retrieved 24 April 2018. ^ "RANDOLPH CHURCHILL'S WILL; Details of the Estate Bequeathed to His Wife and Children". New York Times. 5 March 1895. ^ "Measuring Worth – Measures of worth, inflation rates, saving calculator, relative value, worth of a dollar, worth of a pound, purchasing power, gold prices, GDP..." measuringworth.com. Retrieved 16 March 2015. ^ Roy Jenkins, The Chancellors (1998), pp. 11-12. ^ Jenkins, The Chancellors (1998) p. 36. Beach, Lady Victoria (1932). The Life of Sir Michael Hicks Beach. 2 vols. Churchill, Peregrine; Mitchell, Julian (1974). Jennie: Lady Randolph Churchill. Winston Churchill (1905). Lord Randolph Churchill. London: Odhams Press. Churchill, Randolph S. (1968). Winston S. Churchill. Youth 1874–1900. London. Cornwallis-West, Mrs (1908). The Reminiscences of Lady Randolph Churchill. Drummond-Wolff, Sir Henry (1908). Rambling Recollections. 2 vols. Foster, R F (1988). Lord Randolph Churchill: A Political Life. Jennings, Louis J. (1889). Speeches of Lord Randolph Churchill 1880–88. 2 vols. Martin, Ralph G. (1972) . Lady Randolph Churchill. 2 vols. Rosebery, Lord (1906). Lord Randolph Churchill. Williams, Robin Harcourt (1899). The Salisbury-Balfour Correspondence 1869–1892. Blake, Robert (1985). The Conservative Party from Peel to Thatcher. London. pp. 135–6, 143–5, 148, 151–9, 161, 193, 207. Burke, Bernard; Burke, A.P. (1931). A Genealogical and Heraldic History of the Peerage, Baronetage, the Privy Council and Knightage (89th ed.). London: Burke's Peerage Ltd.
Cokayne, G.E. (1892). "Marlborough". The Complete Peerage of Great Britain and Ireland extant, abeyant and dormant. London: George Bell & Sons; Exeter: William Pollard & Co. vol.4. Cokayne, G.E. (1893). The Complete Peerage. vol 5. London: George Bell & Sons; Exeter: William Pollard & Co.
Cokayne, G.E. (1906). The Complete Baronetage. vol 5. London: William Pollard & Co.
James, Robert Rhodes (1986) . Lord Randolph Churchill. London. Jenkins, Roy (2010). The Chancellors. London. Jenkins, Roy (2009). Churchill. London. Leslie, Anita (1969). Jennie: The Life of Lady Randolph Churchill. Leslie, Anita (1972). Edwardians in Love. This article incorporates text from a publication now in the public domain: Low, Sidney James (1911). "Churchill, Lord Randolph Henry Spencer" . In Chisholm, Hugh (ed.). Encyclopædia Britannica. 6 (11th ed.). Cambridge University Press. pp. 346–347. Quinault, R.E. (1 April 1976). "The Fourth Party and Conservative Opposition to Bradlaugh 1880–1888". English Historical Review. XCI (CCCLIX): 315–340. doi:10.1093/ehr/XCI.CCCLIX.315. Roberts, Andrew (2009). Salisbury. London. Shannon, Richard (1999). Gladstone: Heroic Minister 1865–1898. London. pp. 254–5, 263, 336, 366–72, 399, 429, 433, 444, 459, 563. Weston, Corinne C. (1 January 1991). "Disunity on the Opposition Front Bench, 1884". English Historical Review. CVI (CCCCXVIII): 551–563. doi:10.1093/ehr/XCIX.CCCXCII.551. Wikimedia Commons has media related to Lord Randolph Churchill. "Archival material relating to Lord Randolph Churchill". UK National Archives. Duke of Marlborough is a title in the Peerage of England. It was created by Queen Anne in 1702 for John Churchill, 1st Earl of Marlborough (1650–1722), the noted military leader. In historical texts, it is often to him that an unqualified use of the title refers. The name of the dukedom refers to Marlborough in Wiltshire. Charles Richard John Spencer-Churchill, 9th Duke of Marlborough,, styled Earl of Sunderland until 1883 and Marquess of Blandford between 1883 and 1892, was a British soldier and Conservative politician, and a close friend of his first cousin Winston Churchill. He was often known as "Sunny" Marlborough after his courtesy title of Earl of Sunderland. Jennie Spencer-Churchill, known as Lady Randolph Churchill, was an American-born British socialite, the wife of Lord Randolph Churchill and the mother of British prime minister Sir Winston Churchill. John Winston Spencer-Churchill, 7th Duke of Marlborough,, styled Earl of Sunderland from 1822 to 1840 and Marquess of Blandford from 1840 to 1857, was a British Conservative cabinet minister, politician, peer, and nobleman. He was the paternal grandfather of Prime Minister Sir Winston Churchill. John George Vanderbilt Henry Spencer-Churchill, 11th Duke of Marlborough, was a British peer. He was the elder son of The 10th Duke of Marlborough and his wife, The Hon. Alexandra Mary Hilda Cadogan. He was known as "Sunny" after his courtesy title of Earl of Sunderland. Edward Marjoribanks, 2nd Baron Tweedmouth, was a moderate British Liberal Party statesman who sat in the House of Commons from 1880 until 1894 when he inherited his peerage and then sat in the House of Lords. He served in various capacities in the Liberal governments of the late 19th and early 20th centuries. The Primrose League was an organisation for spreading Conservative principles in Great Britain. It was founded in 1883. George Spencer-Churchill, 5th Duke of Marlborough FSA, styled Marquess of Blandford until 1817, was a British nobleman, politician, peer, and collector of antiquities and books. George Spencer-Churchill, 6th Duke of Marlborough, DCL, styled Earl of Sunderland until 1817 and Marquess of Blandford between 1817 and 1840, was a British nobleman, politician, and peer. The great-grandfather of Sir Winston Churchill, he served as Lord-Lieutenant of Oxfordshire between 1842 and 1857. George Charles Spencer-Churchill, 8th Duke of Marlborough, DL, styled Earl of Sunderland until 1857 and Marquess of Blandford between 1857 and 1883, was a British peer. Frances Anne Spencer-Churchill, Duchess of Marlborough, VA was an English noblewoman, the wife of British peer and statesman John Spencer-Churchill, 7th Duke of Marlborough. One of her sons, Lord Randolph Churchill was the father of Prime Minister Sir Winston Churchill. She had a total of 11 children, and her principal home was the monumental Blenheim Palace, which she rejuvenated with her "lavish and exciting entertainments", and transformed into a "social and political focus for the life of the nation". She was invested as a Lady of the Royal Order of Victoria and Albert for her efforts at famine relief in Ireland.